Please introduce yourself. Who are you? How old are you? Where were you born? Etc. Give the readers some background about yourself. My name is Cathy Mele. I’m 50 years old (how did that happen?!) and I’ve been lifting for a little over 3 years. I’m a native New Yorker, born in Syracuse, and lived most of my life in beautiful Saratoga Springs in upstate NY. We moved to Georgia six years ago. I have a wonderful husband of 23 years and 3 fantastic kids! So far I’ve always competed Raw (unequipped). I started out in the Masters 1b-60kg weight class and then the new 57kg. Last year I decided to move up a class to 63kg. It’s been nice not having to worry about cutting for a meet! 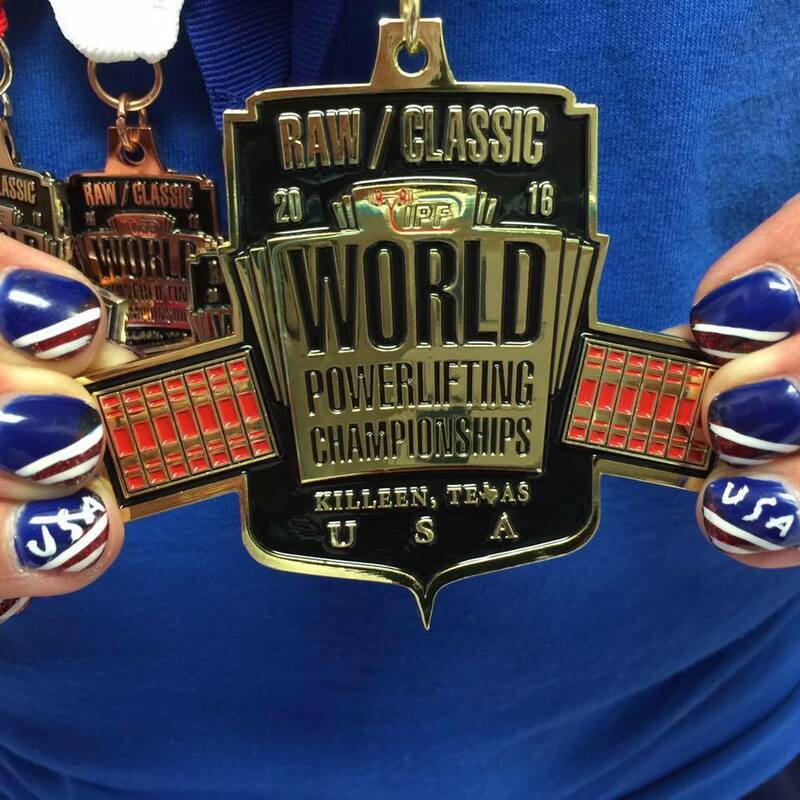 IPF Classic Worlds 2016 in Killeen, Texas. It was a great meet! I was in a very competitive class, M2-63kg, with a lot of great lifters. I won silver in squat, bronze in bench, gold in deadlift and Gold overall! 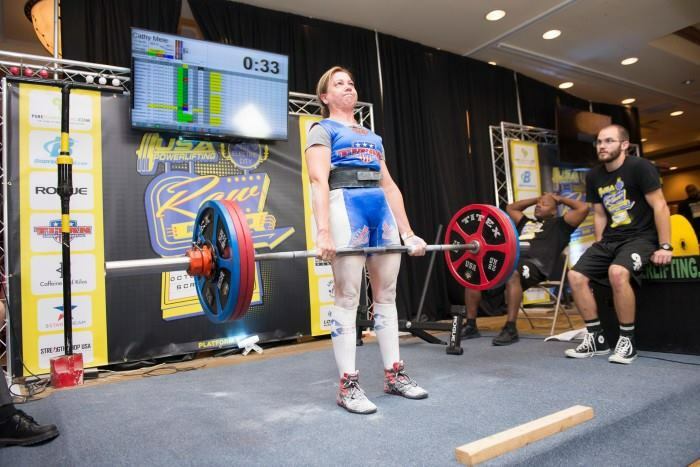 I’m also very proud to say I have the World Record Deadlift in the M2-63kg weight class, 365 lbs. Powerlifting for Pink, 2013 just before my 47th birthday. I put 242.5 lbs on my total in three years. I’m very happy with that! Pretty much the same game plan as usual. I’ve been playing around with squatting in heels vs. flats but that’s about it. I live in Sugar Hill, GA and train at Quest Gym. I coach Kids/Teen Crossfit and some powerlifting classes for No Excuses Crossfit in Suwanee. I homeschool Ethan (the other two graduated!) and I also run an afterschool Good News Club at a local elementary school. I love spending time with my husband and my kids. I don’t have a specific role model. There are many people I admire for different reasons who could all be role models in some way. I have a BS degree in Mechanical Engineering and BA in Physics. Retired from Exxon Mobil after a long 6 years to be a stay-at-home mom. I’m a homeschool mom with a 67% success rate- two in college, one more to go! I have the best training partner, who is also my daughter, Lydia Mele. I have been very blessed to be able to stay at home with my kids--I’ve got it pretty good! Plus I train very early in the morning so it never interferes with my day although it can mess with my evenings. Early bed is a necessity! I had been taking Lydia to Quest to train with Jeff Robison for about 6 months when he asked if I’d like to start training—with “you’re here anyway” logic. So, I started training and did my first meet a few months later at Powerlifting for Pink. First National meet two months after that! I was hooked and the rest is history. Yes, I volunteer when I can. I’m also a state referee. My best numbers are usually in the gym. Training, 250 squat, 160 bench, 385 deadlift ; Competition, 232 squat, 149 bench, 380 deadlift. Find yourself a good coach. They can watch you and help you with form and technique so you won’t develop any bad habits. You will also get programming that’s specific to your abilities. Be patient and forgiving with yourself--Learn from your mistakes. Have Fun. Don’t wait until you’re “good” to enter a meet. Each meet you do will be a fantastic learning experience, so do many in the early stages. We are fortunate in Georgia to have so many to choose from. You will need to learn to be mentally tough. I’ve never gone 9 for 9 so that would be fun and I’d love to hit a 400 lb deadlift. Stay healthy and continue to compete as long as I can. I don’t really have a training philosophy. I just go in and do what coach tells me to do. I think Jeff would say he’s pretty old school. Lots of sets of 3-5 reps with some accessory work thrown in. Deadlift. It’s my best lift. Also, so much fun to come from behind and hit a big deadlift for the win! 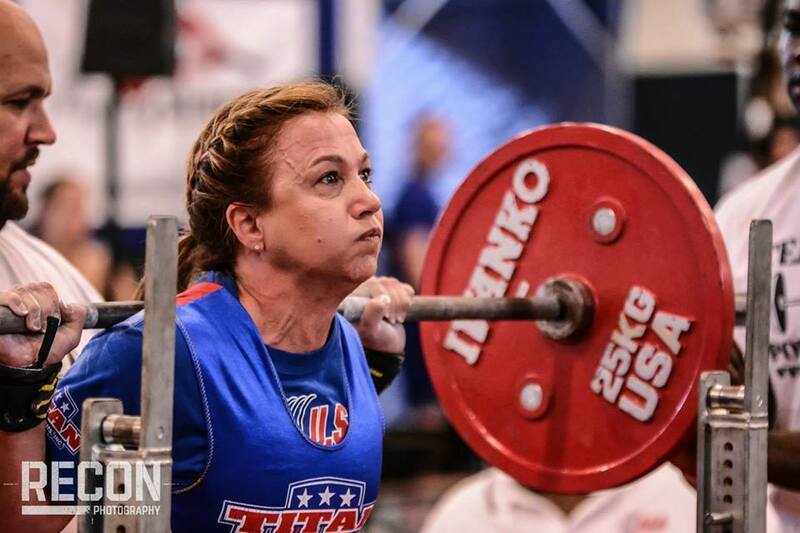 Technically I competed against Jen Thompson in the Open at last years Raw Nationals. Came in behind her at 30th out of 54. Not too shabby for 50 years old and competing for only 3 years, I’ll take it! 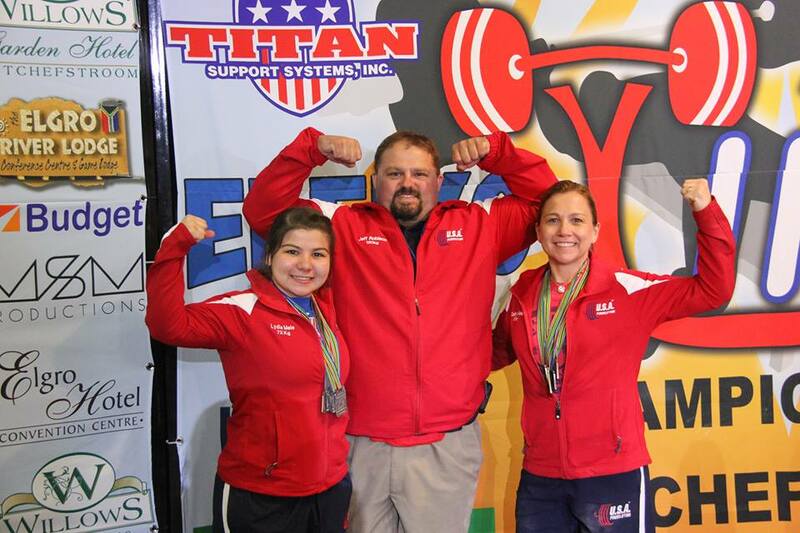 There are many great lifters in the M2-63kg weight class. Joanne Craig is a fantastic 63kg competitor. We had a battle last year at Nationals fighting for the M2 spot on the USA team. I won by only 2.5kg. And there are a lot of strong 49 year olds who will turn 50 next year—this is great motivation for working hard in the gym! My family is healthy, I’m healthy, and I’ve won another World Championship! 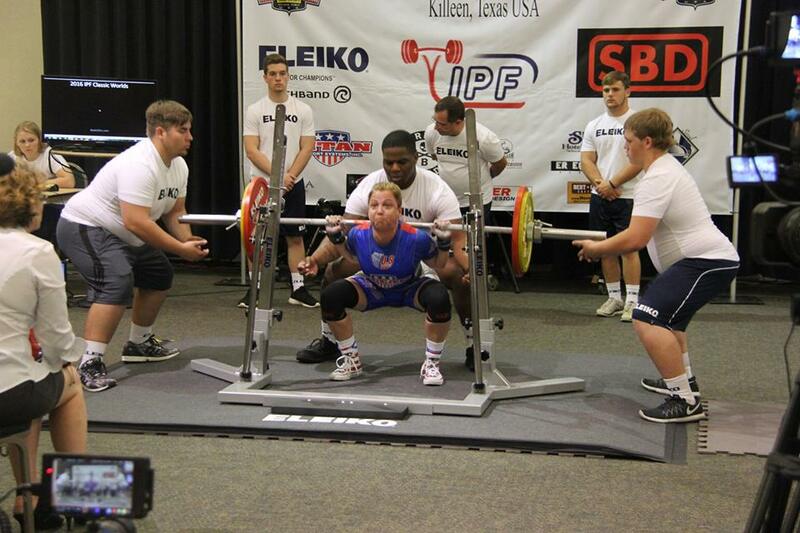 Powerlifting has totally changed my life. 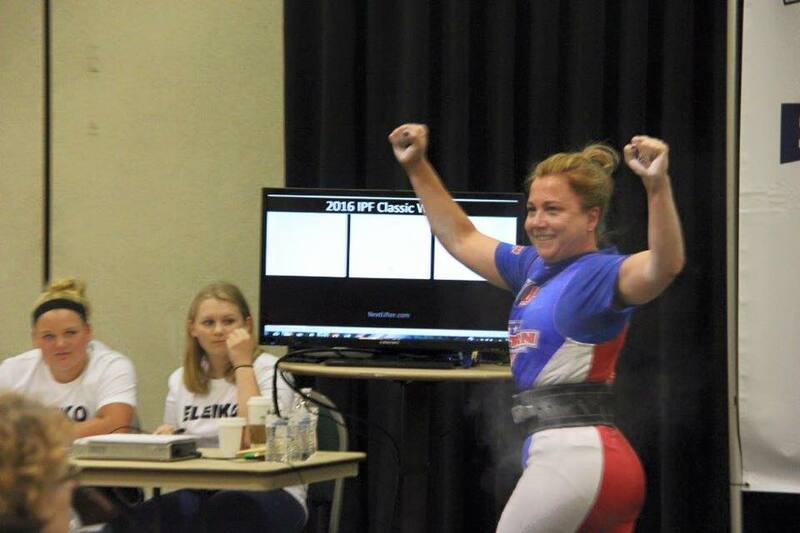 In just 3 years I’ve won two National Championships and been to two IPF World Championships! I won Silver overall in 2014 and just this year, I became the 2016 M2-63kg World Champion! It’s incredible to think that I have a World Record Deadlift and several deadlift American records and GA State records. I couldn’t have imagined any of this just 3 years ago and, Lord willing, I will continue to lift as long as I can. I want to thank all those who support me in this sport. Thank you Jeff Robison for taking me under your wing and believing in me even when I doubt myself. And thank you for being a great coach and friend. Thank you to my awesome daughter and training partner, Lydia Mele. You are such a blessing to me in so many ways. And thank you to my wonderful husband, Robert Mele, for all your loving support and encouragement!